It's not finished yet but it's looking good enough to show. The walls that we started a few weeks ago, and stopped for visitors and when we got our colds, are finished; we still have to paint the skirting boards, trims and doors. The walls are a lovely pale lemon yellow called Milk Maiden, the doors will be a bluish grey called Smoke Rings. We had quite a search for fabric for our curtains. I rang all over the Sunshine Coast, went to a remnant place in Brisbane and searched online, but finally my sister found exactly what I wanted at Ikea in Sydney. It's a cherry red and white check pure heavy cotton. I'm recycling the linings on the old curtains I have hanging now and I'll make the curtains when my sister comes to visit soon. Apart from the paint and fabric I wanted to use what we already had here to change the look we had. I found a few red "things" around the place - an old red Japanese wooden box, some red China from the dinner service I bought in Germany at the end of the 1970s, red felt trims on a lampshade skirt and I'm going to make a few more red fabric decorations that I'll add to the wall with the prints. As you can see, there is a fairly big gap between the top prints and the one below, I'll add a tiny swag of check hearts there. That's the plan, anyway. I might make some red check seat cushions too. We still have to paint this shelving unit. It will probably be an off blueish white, or if we have any Smoke Rings left over, we'll use that. That's the good thing about decorating your own home, you can do exactly what you want and have no one whispering in your ear that you should go and buy new shelves. This is an old lamp that has a plain white shade. It was too bland for this new look so I made a little skirt to just fit over the top of the shade. I cut out some red felt flowers shapes and added them. I think it looks quite nice and just shows what you can do with a little creativity and a sewing machine. When I finish the curtains and other little red touches, I'll take another photo to show the finished room. BTW, if you click on the photos they will be bigger. Is anyone having problems loading my blog this morning? It's very slow for me and I'm not sure if it's my computer or the blog - although other blogs seem to be opening just fine. the decorating looks great! That yellow gives such a "warm" feeling. 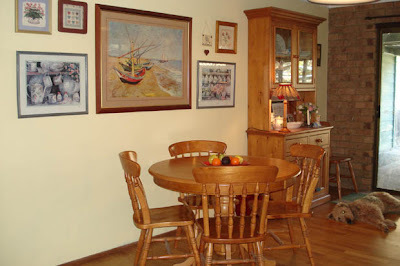 It looks wonderful Rhonda very country homely feel. Yes i to am having trouble opening your Blog it is very slow. I have had trouble with Blogger blogs opening s.l.o.w.l.y today. Yes Rhonda your blog is taking forever to load. I thought it was my computer being lazy. Your decorating is taking shape. Its amazing how a coat of paint can smarten things up. That's great that you found the fabric you wanted. Yes, I found your blog was slow to download too. It looks really nice and fresh Rhonda and I love the lampshade. That will go nicely with your new curtains too. Like the other, your blog was very slow to open today, I had a blank blue page for ages. Hope your trip to Towsville goes well next week, is it? We'll miss you and your wonderful blog! Your home looks beautiful! 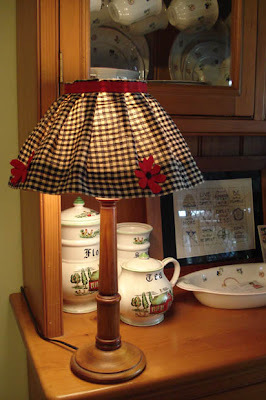 I especially love the lamp skirt! What a great idea! Your blog was a little slow for me, but no to bad! 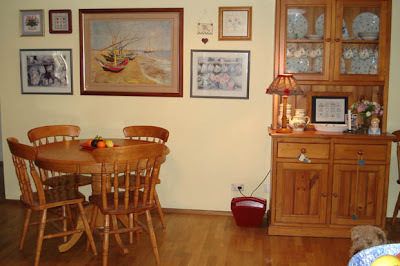 love the photos of your home! everything is looking so inviting and comfortable as well as beautiful. It isn't just your blog. I am having major problems getting my own to open. I am glad its not just me. This looks so inviting and comfortable Rhonda. I really love the way you have arranged the prints above the table. It looks like your dog is very happy with the results too! I am hoping that I am finally going to be able to leave a comment - I have not been able to leave a comment on earlier posts as the comment page kept reloading while I was writing! Seems ok today. So while I have the chance - thank you for all your blog posts, you are providing me with so much inspiration! I find myself thinking about your posts throughout the day and thinking of how I can apply some of what I have learnt to my own life. It is a baby step process! I've tried a number of times to get in to your blog this morning Rhonda and given up until now. Your redecorating is coming along very nicely. I'm a yellow fan so I love the walls and I also love checks so I think your curtains will be beautiful. Your little lamp shade has me thinking now. I have one that could do with a fresh look. Hmmmm. Brigit, we go to Townsville next Wednesday night and I'll be blogging away till we get on the train. LOL We'll be back the following Monday so it won't be too long. Hello Heidi, I wanted to welcome you especially. I'm sorry you've been having problems posting your comments. I wish I could fix these problems myself but they're out of my hands. I'm so pleased I've been able to present you with some fresh ideas for your life. You know, I'm still sorting my own life out each day too. This is not something you do for a while and then it's done. It's a new journey every day and I'm very pleased to have you along for the ride. Keep in touch and let me know how you're going. Thanks Polly. As soon as I finish here I'm visiting your blog. Hi, I just found your blog recently as a result of a recommendation from Shropshire Girl. What I think I like best is that even though you are "living simply" you have everything you need and everything I would need as well. I guess what I mean is that you don't "do without" things that you genuinely need and love. 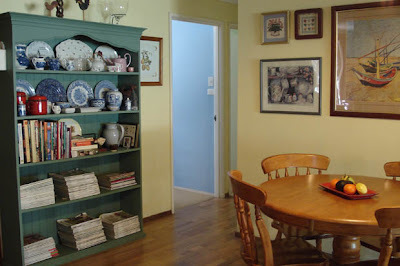 I love the decorating that you have done and the plans for the new decorating sounds colorful and homey. Thanks for a thought-provoking and inspiring blog.